Super Mario RPG: Legend of the Seven Stars began the concept of transforming the world of Super Mario into an RPG series. Though Super Mario RPG never got a proper sequel, its legacy was continued by two series: the handheld Mario & Luigi titles, and Paper Mario. Both series were great in their own right, but it was Paper Mario that felt closer in spirit to Super Mario RPG. Despite the Mario RPGs being among Nintendo’s best titles – up there with Zelda, Donkey Kong, and the Mario platformers – Nintendo, for reasons that will never make sense, decided to opt out of the Mario RPGs as time went by. The last two Mario & Luigi titles have basically stripped away the depth in story, characters and gameplay from the first three titles, but Paper Mario has been altered all the more. Super Paper Mario took away the turn-based battles in favor of platforming with RPG elements, though it retained the strong storytelling of the previous Paper Mario entries. It was Paper Mario: Sticker Star on the 3DS however, that remains one of Nintendo’s biggest blunders. Sticker Star brought back turn-based battles, but replaced the RPG elements with collectible stickers, a gimmick that quickly grew tired and even made battles predominantly pointless, since your only reward for winning battles were more stickers and coins…for buying more stickers. Not to mention the game removed virtually every story and character aspect of its predecessors, leaving it soulless on both a narrative and gameplay standpoint. 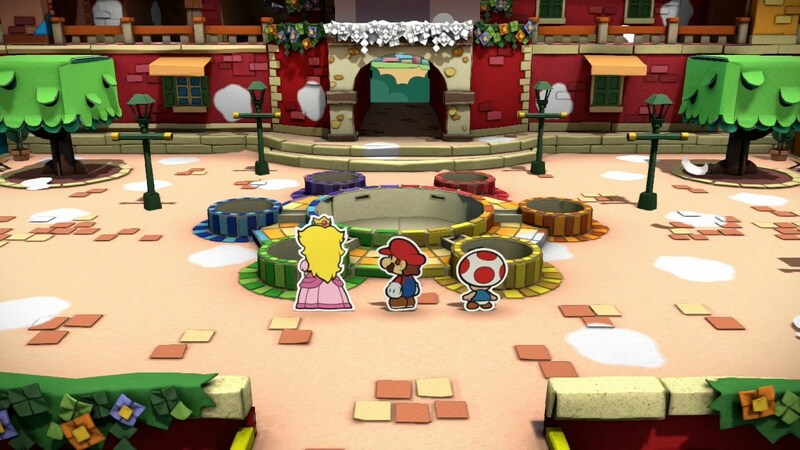 Sticker Star was greatly disliked by longtime fans of the series, and when Paper Mario: Color Splash was first revealed and looked to be replicating Sticker Star’s style, it seemed doomed from the start. But does Color Splash fix the many problems of Sticker Star? Or does it fall just as flat? To put it simply, if Sticker Star broke the Paper Mario series, Color Splash does a pretty good job at fixing it. But even if you repair something after its been broken, it’s never going to look quite as good as it once did. Paper Mario: Color Splash does adopt much of Sticker Star’s formula. 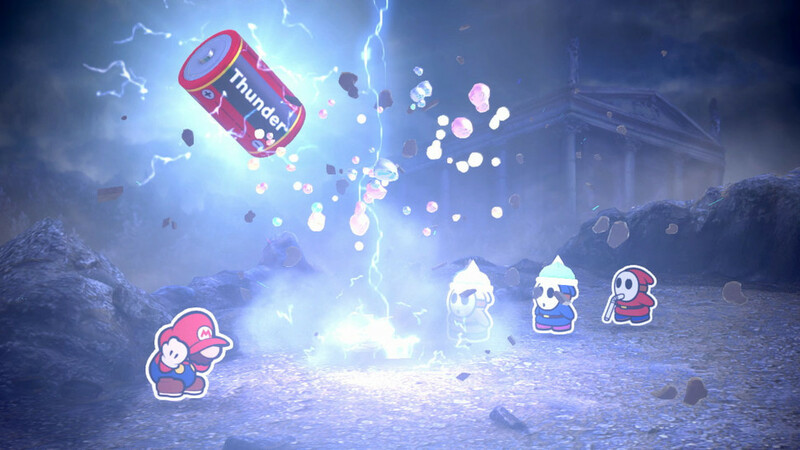 Battles still use consumable actions (here presented as cards), and Mario still doesn’t gain levels, nor is he joined by any memorable partners that can aid him in battle (though his adventure is joined by a sentient paint bucket named Huey, who is a far more charming and funny character than Sticker Star’s Kirsti ever was). There is a bonus this time around in the form of paint. 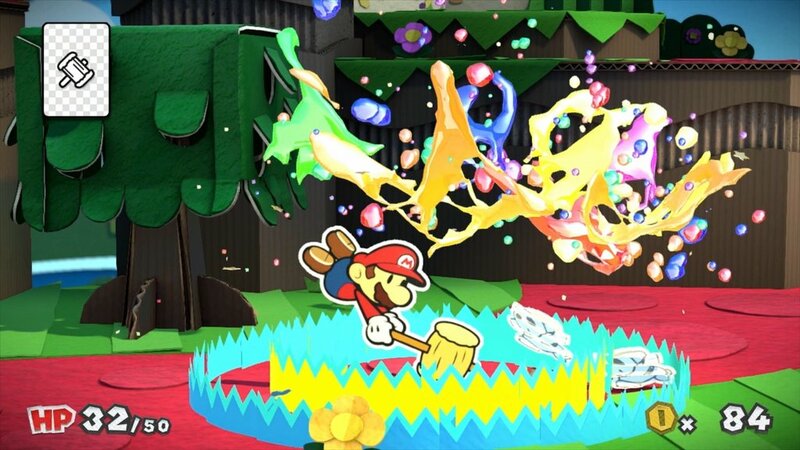 Mario must paint his cards in battle to fully power them up, and also paint areas of the environment that have been drained of their color using the paint hammer. The inclusion of paint benefits the battle system by the addition of Hammer Scraps, collectible items that are rewarded after battle. Hammer Scraps more or less work like experience points, and when enough are collected, the maximum amount of paint Mario has at his disposal increases. This difference alone prevents the battles from feeling pointless, as they did in Sticker Star, though it sadly cannot change the tediousness of the battles themselves. There’s no beating around the bush, making all of the actions in battle consumable items is simply bad game design. Sure, the game throws cards and coins at you all the time, so you’re rarely going to run out of actions, but you may easily run out of the cards you need for a given enemy or situation. You’re constantly scrambling to get the right cards, or going out of your way to get enough coins to buy them by the bulk, just so you’re sure to have enough to make your way through a specific section. To further complicate things, the process of using these cards in battle is just as tedious as anything. You have to cycle through your cards on the Gamepad (which are always categorized, left to right, from oldest to newest), then set up the cards you want to use, tap the chosen cards to paint them, select the “done painting” option, and then finish things off with an entirely unnecessary “flick” motion to send the cards from the Gamepad to the TV. Then, and only then, can you perform the usual action commands in battle. The process can grow old fast, and you may find yourself avoiding enemies just so you don’t have to keep going through it. Another huge downside to battles is that Mario will automatically attack the on-screen enemies in a set sequence from left to right. 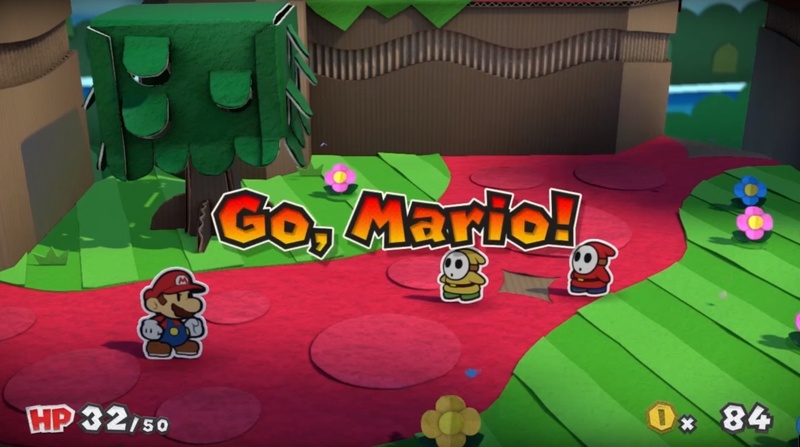 This not only removes so much potential strategy in battles, but also means that, should you defeat some enemies too soon, Mario could end up screwing things up (like jumping on a spiked enemy) and the player can’t do anything about it. Finally, “Things” make a return from Sticker Star, being 3D objects that can be turned into super powerful cards for use in and out of battle. Each Thing includes a hilarious in-battle animation (like a breakdancing piggybank or a tornado-like washing machine), and make for fun special attacks. The problem with Things arrises during boss battles. Every boss in the game must have a specific Thing used against them in order to defeat them. It is mandatory that you have a specific Thing with you during each boss, so that you can use them at the right moment. If you don’t have the right Thing, the bosses are, quite literally, impossible. If this worked like Mega Man, and specific Things were merely particularly effective against certain bosses, it could be really fun and clever. Instead, you have bosses that are only beatable with specific items. There’s no strategy involved. If you know what Thing you need, you basically have victory guaranteed. It’s yet another display of blatantly bad game design. Thankfully, this is where most of the complaining stops, because the aspects of Paper Mario: Color Splash that are enjoyable are very much enjoyable. For starters, there’s a much greater emphasis on story and character than there was in Sticker Star (of course, any story and character at all would be much more than Sticker Star, but it’s intended as a compliment). The plot is simple enough, with Mario and Peach traveling to Prism Island – a land renowned for its vibrant colors – after they receive a Toad drained of its color in the mail, sent from the island to the Mushroom Kingdom. 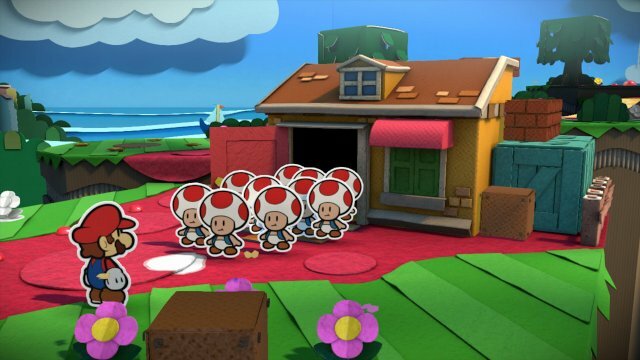 Once they arrive at Prism Island, Mario and Peach find that the place is being drained of its color by an army of Shy Guys. Naturally, Bowser is up to his old tricks again, and it’s up to Mario, and his new paint bucket partner Huey, to restore color to the island and rescue the Paint Stars. 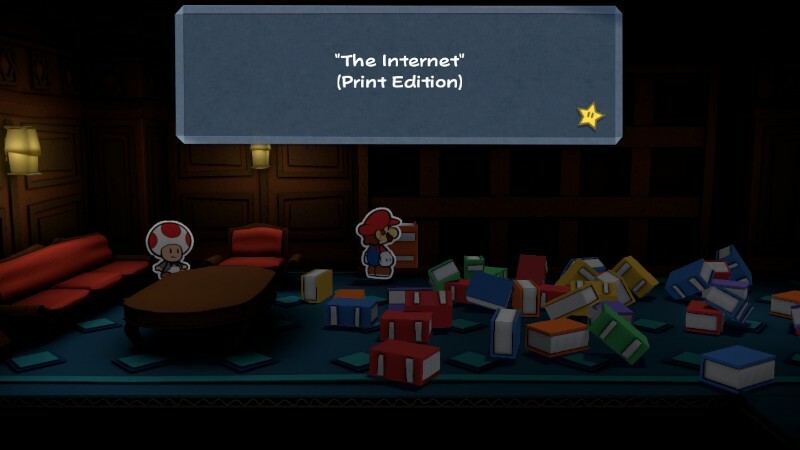 So the plot itself is nothing grand like Super Mario RPG or the first two Paper Marios, but Color Splash does liven things up with terrific writing and the series’ trademark humor. Color Splash is one of the funniest games I’ve played in a long time. Whether it’s the visual gags that make great use of the paper motif, or the constant zingers the characters are spouting, Color Splash actually elicited a good number of laughs out of me throughout my playthrough. Yeah, no kidding. I miss unique Toads. On the downside of things, Color Splash continues Nintendo’s bizarre recent trend of making every NPC a generic Toad, with their only differing features being the colors of their spots and vests. 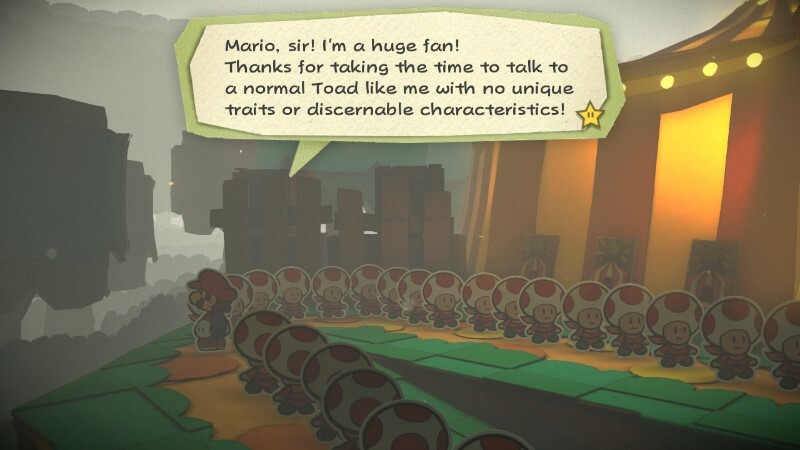 I honestly can’t grasp why Nintendo thinks having every NPC looking like the standard Toad is more charming than the variety of characters found in past Paper Marios. It just takes away personality from the game. This lack of variety also shows up in the enemies, who are relegated to simply being returning foes from Mario’s platforming ventures. Even the aforementioned bosses are restricted to the Koopalings. I seriously don’t understand Nintendo’s refusal to add new enemies to the Mario RPG series anymore. On a lighter note, another highlight has to be Color Splash’s aesthetics. The game is absolutely gorgeous to look at, with Nintendo bringing the paper craft visuals of the series to life like never before. There are so many little details all over the place that make the environments pop. You can definitely tell the developers were having a great time thinking of ways to recreate Mario’s world out of handcrafted materials. It’s an absolutely beautiful game to look at, and it’s full of visual surprises. Arguably even better than the visuals is the musical score. Color Splash follows in the tradition of the Galaxy series and 3D World of integrating a full band orchestra into the Mario series, and just as in past efforts, it pays off beautifully. Color Splash’s soundtrack is often (and appropriately) colorful and lively, but it ends up showcasing a wide variety of styles and tunes. It’s one of the best Mario soundtracks of the last few years. Much of this review may sound a bit negative, but rest assured, the good ultimately outweighs the bad. Nintendo’s stubbornness may have never been quite as pronounced as it is here, with the continuing of Sticker Star’s infamous template. But the fact that Color Splash can take such a flawed blueprint and turn it into a very fun experience is also one of the biggest testaments to Nintendo’s mastery of the craft. I very much love most of Paper Mario: color Splash: It looks stunning, sounds great, it’s often hilarious, always charming, and is full of fun little gameplay surprises. But the flaws that are present are a bit too prominent, and you may find that Color Splash is at its best in stages that work as their own, self-contained little narratives, and place the battle system to the side. Still, a tedious battle system is better than the pointless one of Sticker Star, and the stories, characters and writing that are present here help give the game an identity that was lacking not only in Sticker Star, but the past few Mario & Luigi titles as well. Paper Mario: Color Splash may not bring back the glory the Mario RPGs once showcased so profusely, but its creativity and charm are so endearing that you can’t help but feel it’s getting things back on track. But seriously, can we please just get a proper Mario RPG again? Please? !